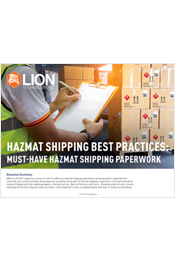 Updates in the proposed rule will incorporate recent amendments to international regulation and consensus standards into 49 CFR and make changes to nearly every part of the hazmat rules, including Proper Shipping Names, hazard classes, packing groups, special provisions, packaging authorizations, and quantity limits. Complying with rules from two different regulatory agencies at the same time can be very tricky territory. Here's how to tackle it. US DOT’s Pipeline and Hazardous Materials Safety Administration (PHMSA) published a Final Rule on November 7, 2018 to update, clarify, streamline, and provide new relief from certain hazmat rules. FedEx recently posted a note to customers regarding its updated operator variations published in the 60th Edition IATA Dangerous Goods Regulations (DGR). Two Standards that OSHA Plans to update are the Powered Industrial Trucks (Forklifts) Standard at 29 CFR 1910.178 and the Lockout/Tagout Standard at 29 CFR 1910.147. Can I Reuse Hazmat Packaging? How do we know when DOT will allow us to reuse a package, e.g., a drum? What are the requirements for reusing packaging, and where can shippers find them?